After documenting the stock components on the Wheelsport Fantasy 2.0 flat handlebar bike, it is now time to give it an upgrade! First, I will be removing all the components from the bike, and also clean up the frame. At the same time, I can weigh all the components. This will enable me to give an accurate part-by-part summation of the weight of the full bike. Another thing to note is that I only weighed the parts which I plan to use on the upgraded bike. Those components which I am not using again will not be weighed. I started with removing the wheels from the bike frame. I did not remove the tires and tubes from the wheelset as I will be using the same tires and tubes. As such, the weight of the wheels are inclusive of the tire and tube. Assuming a tire weight of 250 grams each, and a inner tube weight of 100 grams each, the weight of these 451 wheels can be estimated to be 516 grams for the front wheel, and 704 grams for the rear wheel. This gives a wheelset weight of 1220 grams which is a good weight. Compared to the 406 sized Wheelsport Sunny wheelset on the Dahon MuEX (484 grams for front, 709 for rear), the weight is quite similar. After removing the cassette, I took the chance to clean and lubricate the freehub mechanism. The construction is slightly different from the earlier Wheelsport hubs, as can be seen from this maintenance guide. 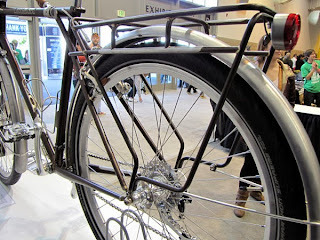 Close up look of the folding handlepost. 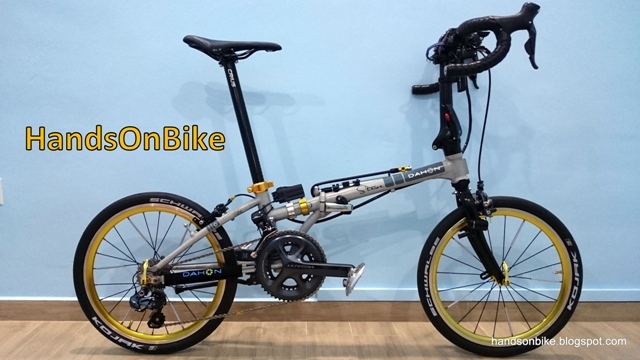 It is similar in design to Dahon/Fnhon/Tern handleposts, with a centre compression bolt and 2 side clamp bolts. Close up look at the sealed bearings of the headset. The bearing size and angle can be found marked on the bearing. Finally, the bare frame with every component removed! After removing all the components, the bare frame can now be weighed. Inclusive of all the hardware such as the seatpost clamp, RD hanger, headset cups, BB guide and cable adjust bolts, the frame weighs about 1.8kg. Adding the fork (697 grams) and handlepost (401 grams), the total Wheelsport Fantasy 2.0 frameset weight (folding handlepost version) is about 2.9kg. For comparison, the Tyrell FX frame weighs 2.2kg, with a fork weight of 909 grams, giving a total frameset weight of around 3.1 kg. The difference is, the Tyrell FX comes with additional folding capabilities, which accounts for the higher weight due to the folding joints. Non-folding Tyrell frames such as the aluminium-carbon CSi or the titanium PKZ would be lighter in weight. In the next part, I will be reassembling the bike with some of the original components and also some new components. Hi I was wondering what kind of treading does the BB shell have is it Enclish treading?